Kara Elliott recalls the moment she was diagnosed with breast cancer. "Your immediate thought is, 'I'm going to die. I don't want to die. I have a 4-year-old. I have a husband,'" Elliot said. Elliott decided to have a double mastectomy, but the removal of her breasts left a void. "Once you get through everything, am I still me? Am I still whole? Can I resume the life I had?" Elliot said. She decided she wanted to gain back what cancer took away. She wanted to have reconstruction surgery. 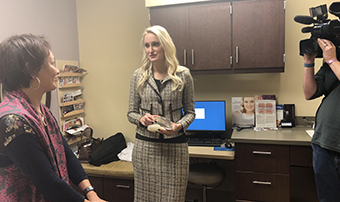 It was possible through a process called acellular dermal matrix, but she would need the surgical expertise of Dr. Katie Honz, a plastic surgeon with Methodist Physicians Clinic, and a complete stranger.